SEAPORT DISTRICT 142 • SHOPPING CENTER BUSINESS • May 2017 S ometimes you can't see the forest for the trees. In Lower Manhattan's Seaport District, New Yorkers some- times can't see New York for the tourists. The Howard Hughes Corporation is opening up the views and redeveloping several blocks along the East River to cre- ate a retail and entertainment destination that appeals to the growing population in Lower Manhattan and residents of the Greater New York metro, as well as tour- ists that love the skyline views in the area. 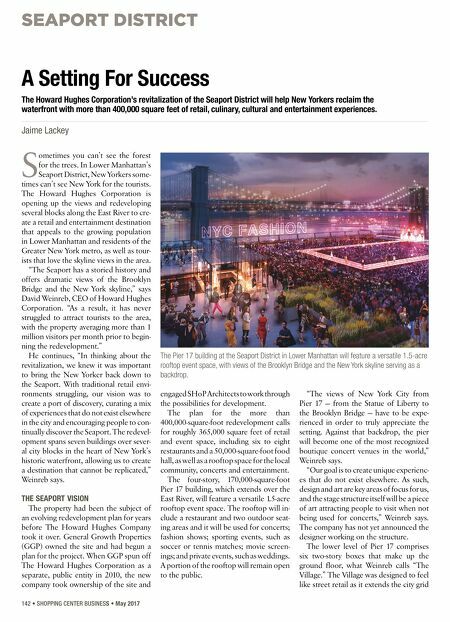 "The Seaport has a storied history and offers dramatic views of the Brooklyn Bridge and the New York skyline," says David Weinreb, CEO of Howard Hughes Corporation. "As a result, it has never struggled to attract tourists to the area, with the property averaging more than 1 million visitors per month prior to begin- ning the redevelopment." He continues, "In thinking about the revitalization, we knew it was important to bring the New Yorker back down to the Seaport. With traditional retail envi- ronments struggling, our vision was to create a port of discovery, curating a mix of experiences that do not exist elsewhere in the city and encouraging people to con- tinually discover the Seaport. The redevel- opment spans seven buildings over sever- al city blocks in the heart of New York's historic waterfront, allowing us to create a destination that cannot be replicated," Weinreb says. THE SEAPORT VISION The property had been the subject of an evolving redevelopment plan for years before The Howard Hughes Company took it over. 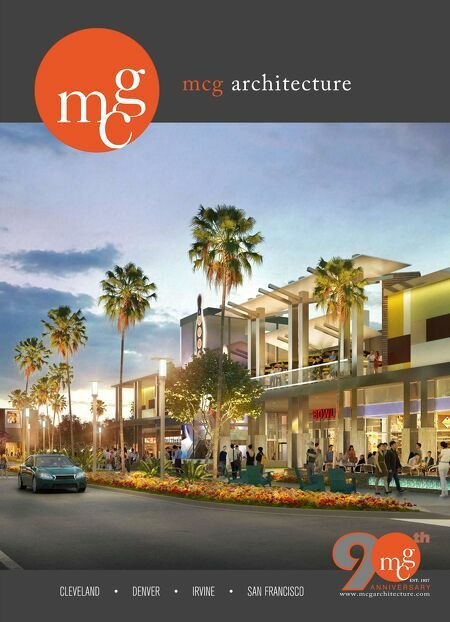 General Growth Properties (GGP) owned the site and had begun a plan for the project. When GGP spun off The Howard Hughes Corporation as a separate, public entity in 2010, the new company took ownership of the site and engaged SHoP Architects to work through the possibilities for development. The plan for the more than 400,000-square-foot redevelopment calls for roughly 365,000 square feet of retail and event space, including six to eight restaurants and a 50,000-square-foot food hall, as well as a rooftop space for the local community, concerts and entertainment. The four-story, 170,000-square-foot Pier 17 building, which extends over the East River, will feature a versatile 1.5-acre rooftop event space. The rooftop will in- clude a restaurant and two outdoor seat- ing areas and it will be used for concerts; fashion shows; sporting events, such as soccer or tennis matches; movie screen- ings; and private events, such as weddings. A portion of the rooftop will remain open to the public. "The views of New York City from Pier 17 — from the Statue of Liberty to the Brooklyn Bridge — have to be expe- rienced in order to truly appreciate the setting. Against that backdrop, the pier will become one of the most recognized boutique concert venues in the world," Weinreb says. "Our goal is to create unique experienc- es that do not exist elsewhere. As such, design and art are key areas of focus for us, and the stage structure itself will be a piece of art attracting people to visit when not being used for concerts," Weinreb says. The company has not yet announced the designer working on the structure. The lower level of Pier 17 comprises six two-story boxes that make up the ground floor, what Weinreb calls "The Village." The Village was designed to feel like street retail as it extends the city grid A Setting For Success The Howard Hughes Corporation's revitalization of the Seaport District will help New Yorkers reclaim the waterfront with more than 400,000 square feet of retail, culinary, cultural and entertainment experiences. Jaime Lackey The Pier 17 building at the Seaport District in Lower Manhattan will feature a versatile 1.5-acre rooftop event space, with views of the Brooklyn Bridge and the New York skyline serving as a backdrop.